Office Manager Kim Chism and Family Nurse Practitioner Aaron Druck are staffing a new location of Front Range Clinic on Florida Road. The clinic provides medication-assisted treatment for those with addictions. It, too, is called Front Range Clinic. The center opened last week in the 1400 block of Florida Road and will serve those with opioid and alcohol addictions. The clinic offers medication-assisted treatment to those with addictions – a clinically proven approach to treating opioid and heroin addiction. The clinic specializes in Suboxone and Vivitrol treatments, which block the effects of opioid pills and heroin. 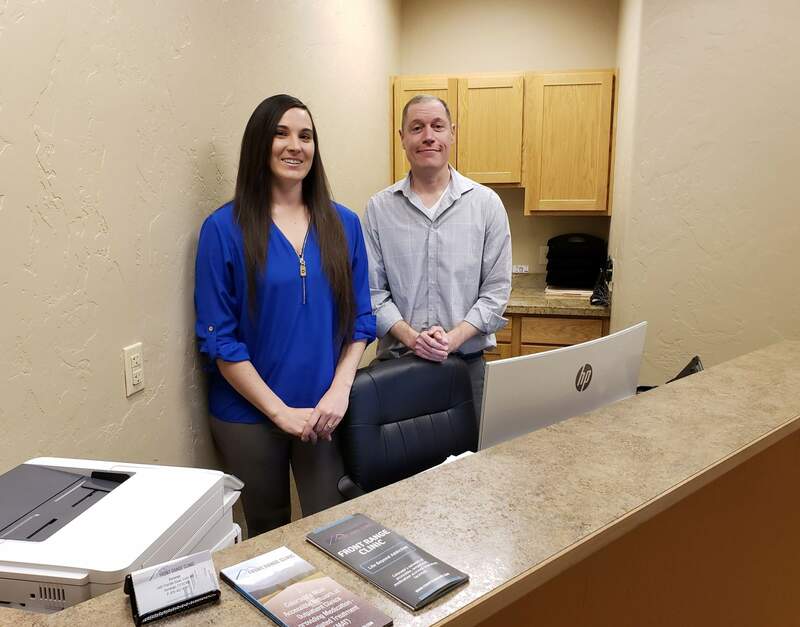 Treatment options for those with addictions are limited in Southwest Colorado, and Druck expects the new clinic will serve the region. A 2017 analysis by Colorado Health Institute identified only one medication-assisted treatment clinic in a 15-county region that makes up the southwest portion of the state. It is unknown which clinic the analysis was referring to because there were at least two clinics and additional independent doctors providing treatment in La Plata County, including Colorado Addiction Treatment Services in Durango. Peaceful Spirit treatment services used to offer treatments, but it has closed. Drug overdose deaths have been on the rise statewide. In 2017, more than a 1,000 people died by drug overdose, according to the Colorado Health Institute. About 370 of those deaths were related to opioid prescription pain medications. The new clinic in Durango offers Suboxone, a combination of buprenophine and naloxone, because it is a safe treatment, Druck said. Patients who are opioid dependent cannot overdose on Suboxone alone, he said. “We work in a harm-reduction model. We try to meet patients where they are at,” he said. Druck prescribes Suboxone as an oral dissolving strip patients take every day. The minimum amount of time most patients need to be on Suboxone is 16 weeks, he said. The clinic’s other specialty, Vivitrol is an injection that will block the effects of opioid-based substances for a month, he said. It can also block cravings for alcohol for some patients, he said. The clinic does not offer counseling, but it plans to connect patients with behavioral health options, Druck said. The clinic accepts Medicaid, Medicare, United Health Care and Cigna. It will also work with patients who are uninsured, said office manager Kim Chism. For the uninsured, monthly treatments will cost $120 a month, excluding medication costs, she said. Front Range Clinic will also provide court-ordered treatment.